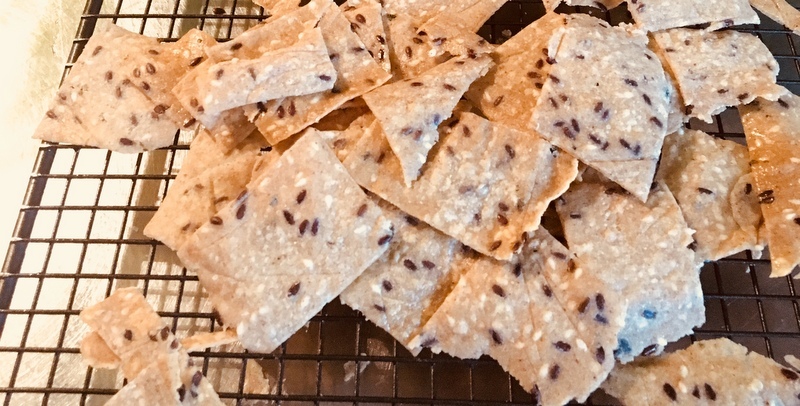 With just a handful of simple ingredients you can create these most wholesome and crunchy crackers which give store bought varieties a run for their money. Very handy to have around these crackers are! Top with a homemade dip and you’ve got an unbeatable little snack. Preheat oven to 165ºC fan force. Combine the flour, sesame seeds, flaxseeds and sea salt in a mixing bowl. In a small bowl, whisk the water, olive oil and sesame oil and pour into the dry ingredients. Gently mix with a wooden spoon and then with your hands to form the dough. Do not overwork the dough. It should easily come together and form a smooth dough. If you find the dough sticky, simply sprinkle with a little more flour. Divide the dough into two balls and split each balls into two. You now have four balls to work with. Grab one of the balls and roll out between two sheets of baking paper until super thin, about a millimeter. Remove the top baking sheet. Grab hold of the bottom baking sheet and carefully transfer the rolled out dough onto baking tray. Brush with a little olive oil and cut to desired cracker size (a pizza cutter works fabulously here, but a non serrated knife will do too). Repeat this process for the other three balls. Bake for approximately 12-15 minutes or until just starting to brown and feel firm when you tap them. Watch them closely the first time you make them as each oven varies. If you have a large oven, you’ll be able to bake once, otherwise you may have to bake in batches. You may find the outer ones are ready before the middle section, so take those out and continue to bake until the rest of the crackers are done. Store in a glass jar in a cool dry place for up to two weeks.